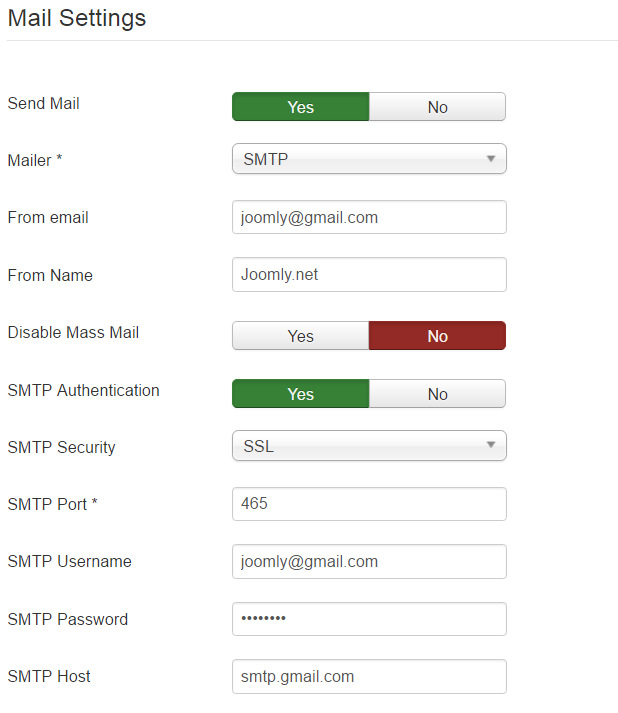 This topic shows you how to configure SMTP mail for Joomla. Firstly, open “System->Global configuration” in the top menu in the admin panel and choose the tab “Server”. Find the “Mail settings” and select SMTP in the “Mailer” drop-down list. Follow “From email” and “From Name” fields. Further, follow fields in depending on your mail server. You can find the settings for the different emails below or easy google it by request like “SMTP google”. On the screenshot below you can find default settings for the google SMTP. Turn on account access here and unblock captcha here. Read about SMTP errors here.